them on the line. I glanced over in the garden. The zucchini plants have grown huge with the rain we've been having. There was a zucchini about 6 or 7 inches long. The first one of the year. I hadn't even noticed it growing. So, I took a picture of it. Well that's what I needed for insomnia. You make me tired with all that! 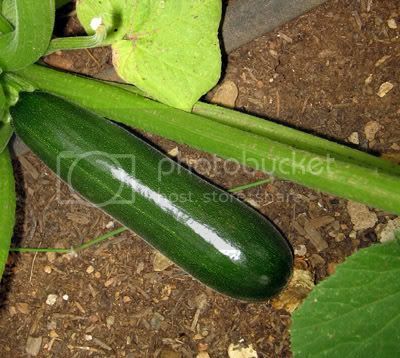 Nice looking courgette. It looks like a bit like the 'Kojak'. Do you know the type it is? Good luck with your lists, Dooley....you've been a busy-bee haven't you! Hardworkin woman. I'll bet everything looks great! I am now wore out.I'm sure glad I'm not having to keep up with you.My gosh I don't see how you do so much.You are a very busy lady.